Landfill Manager Danny Springer, County Commissioner Dan Dean, County Commissioner Jack DeWeese, County Commissioner Tony Anderson, District Director Erica Tucker, and Assistant District Director Lauren Grooms pose in front of the new recycling bins in their new location. The Robinson Road landfill’s recycling station was recently moved from its old location within the landfill to a new location in front of the landfill on a concrete pad. New recycling bins were provided by Rumpke, and concrete was poured for the pad under the direction of Fayette County Engineer Steve Luebbe. The project cost $40,000. Erica Tucker, district director for the Solid Waste District that includes Ross, Pickaway, Highland and Fayette counties, said the bins were moved because they were previously “in a poor location” and “we just wanted to increase visibility.” The new site is now the largest in the district, according to Tucker. The site is open but is not yet complete. Tucker said two additional bins will be added and she hopes to build a fence around the pad, which she said would help to keep debris from being blown around. In addition to managing the bins, the solid waste district hosts annual recycling events to recycle items that cannot simply be discarded in these bins. Fayette County’s event will be held at the fairgrounds on Sept. 8 from 8 a.m. to 12 p.m. This event will focus on recycling tires and electronics. Passenger and light trust tires can be recycled for $3 each, and the first five will be free. Truck tires ranging in size from 15.5” to 24.5” can be recycled for $10 each. Farm tractor tires can be recycled for $35 each, and O.T.R. loader tires $50 each. Other miscellaneous tires will be priced on site. A wide variety of electronics will be accepted at the event, including: household electronics, computers and computer components, phones, cables, stereo equipment, video game systems, cameras, iPads, iPhones, scanners, lithium-ion batteries, microwaves, vacuum cleaners, smart boards, satellite cable boxes, and televisions. There will be a $5 disposal fee for computer monitors and televisions. 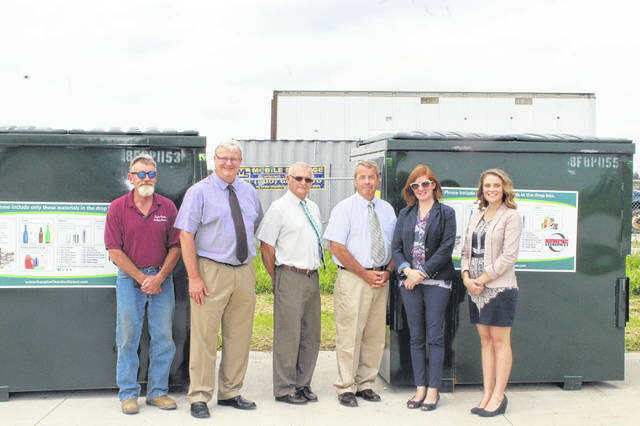 https://www.recordherald.com/wp-content/uploads/sites/27/2018/08/web1_recycling-pic.jpgLandfill Manager Danny Springer, County Commissioner Dan Dean, County Commissioner Jack DeWeese, County Commissioner Tony Anderson, District Director Erica Tucker, and Assistant District Director Lauren Grooms pose in front of the new recycling bins in their new location.